Remington Golden Saber Black Belt 45 ACP AUTO Ammo 230 Grain Brass JHP for sale online at cheap discount prices with free shipping available on bulk 45 ammunition only at our online store TargetSportsUSA.com. 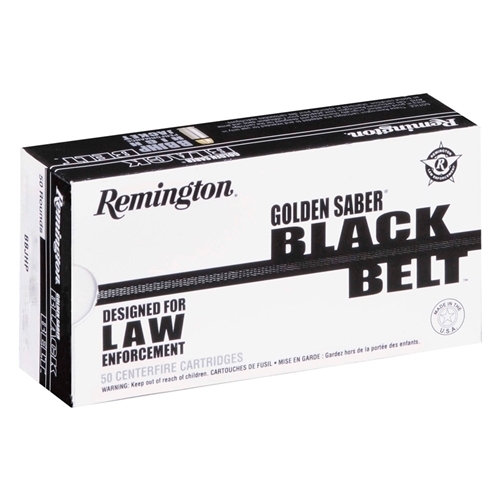 Target Sports USA carries the entire line of Remington Golden Saber ammunition for sale online with free shipping on bulk ammo including this Remington Golden Saber Black Belt 45 AUTO Ammo 230Grain Brass Jacketed Hollow Point. Remington Golden Saber Black Belt 45 ACP AUTO Ammo 230 Grain Brass JHP ammo review offers the following information; Remington puts their all into the Golden Saber line and this 45 AUTO cartridge shines like the rest! In developing the Golden Saber line, Remington demanded that it would meet four precarious fundamentals; match-type accuracy, deep penetration, maximum expansion and virtually 100% weight retention. Remington Golden Saber also features mouth and primer waterproofing for longevity of the rounds, they are treated with powder for a low muzzle flash and primers that must go through three (3) inspections before being on the market. Remington's Gold Saber 45 AUTO was designed specially for law enforcement and self defense applications. Remington 9mm Luger is loaded with a 230 grain Brass Jacketed Hollow Point. Dead serious innovation, a superior bullet for when stakes are high, this high performance jacket handgun ammunition was built around revolutionary hollow point design. 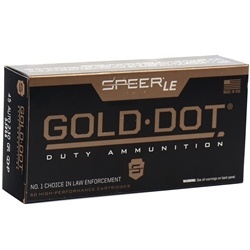 The bullet jacket is made of brass, which releases energy over longer distance while mushrooming and a spiral nose cut feature allows mushrooming at a lower velocity without sacrificing penetration or terminal performance. The precise hollow point cavity design also increases penetration by minimizing lead core deformation. Remington Golden Saber is new production, non-corrosive ammunition in boxer primer and reloadable brass cases. Snappier than RGS BJHPs but it works.